The Newest Rant: Oh, so that's what Mystery Men is. Back around the start of February I had a post about a strange Marvel teaser for the, "Mystery Men," and wondered aloud what it was. Well, wonder no more as much has been revealed by Marvel at the latest comic convention. Apparently the current scribe of Blank Panther, David Liss, will be writing and Patrick Zircher (whom I've never heard of until now) will be doing the art. 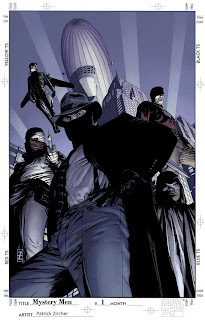 Zircher seems to have experience with stuff in this theme, having apparently done Spider-Man Noir. This has been described in the press as a pulp-styled adventure, and it has two issues shipping as soon as this June. It seems to be worth a look. I was well off the mark with my predictions! Still, looks interesting. Have you read any of the Marvel Noir books? The only one I got was Punisher, which I thought was pretty good. I loved X-Men Noir and its sequel, the first Spider-Man Noir was decent, and Luke Cage Noir was pretty good. Other than those I didn't check any out other than the first issue of Wolverine Noir which I promptly stopped reading due to severe disinterest.